Amid the teeming bustle of exotic Istanbul’s overall population of 13 million people there is yet a darkly quiet place to find serenity. Much of the time you must turn your head sideways to view Istanbul’s impressive architecture in entirety if close; around the thoroughfares you strain your eyes upward; your ears are filled with the sounds of many languages and the calls to prayer. You enjoy athan, the powerful and melodic call to prayer, emanating from imposing mosques with endless domes and minarets. You hear street sellers shouting “sıcak simit” (hot simit) at the top of their lungs. You delight in the smell of simit – a coiled sesame bread ring like a bagel (and maybe its inspiration – and a plethora of other foods sold all around this great city. Everywhere you come across a myriad of tourists, strolling around the city, with their mouths half-open out of sheer amazement, taking zillions of photos, and exploring the overwhelming history of this city continuously occupied for almost 2,000 years, from the time when it was Constantinople, named after the Roman emperor because this city became the new capital of Rome. You must look very much like one of the tourists even though you are living here for months. You will likely agree with me that on a hot summer day at some point, almost any visitor to Istanbul will wish for shelter from the summer heat, the din of a metropolis, and the crowds of shoppers and tourists in the many bazaars. After a trip to the Basilica Cistern I found that it was an ideal shelter contradicting many conditions of the outside world: it was cool, dark, tranquil, and mysterious. Basilica Cistern is an underground cistern built by the late Roman or early Byzantine Emperor Justinian the Great in Constantinople during the 6th century. It was constructed under a large public square, the Stoa Basilica, after which it was named. Some call it “The Sunken Palace” (Yerebatan Sarayi in Turkish) due to its underground magnificent marble columns rising out of the water. Constantinople is now abbreviated to Istanbul in Turkish since the Byzantine capital fell in 1453 to Ottoman ruler Mehmet II. But it has nearly always held prime a attraction for superpowers for its mix of East and West at the exotic crossroads of Europe and Asia. In the early Byzantine Period, emperors built cisterns around the interior of the walled city to meet the water needs of residents, particularly during wars where sieges were a dire threat. According to some historical texts, as many as 7,000 slaves were employed in the construction of the Cistern. Water was brought from the hills of Belgrade Forest located 12 miles away. After the Ottoman conquest of Constantinople, the Ottomans used the Cistern water to irrigate the gardens of Topkapi Palace. After they installed their own relatively modern water system, however, the Ottomans stopped using the Cistern’s water. This Cistern went unrecognized by the Western world until P. Gyllius, a Dutch traveler, discovered it during his visit to Istanbul in 1544-1550. Gyllius came to Istanbul to conduct research on its Byzantine remains. While he was around Hagia Sophia, he was surprised to see people getting water with buckets from some well holes, and even catching fish. P. Gyllius decided to explore this well. To his amazement, during his boat trip to the large well, he ended up discovering a historical cistern. 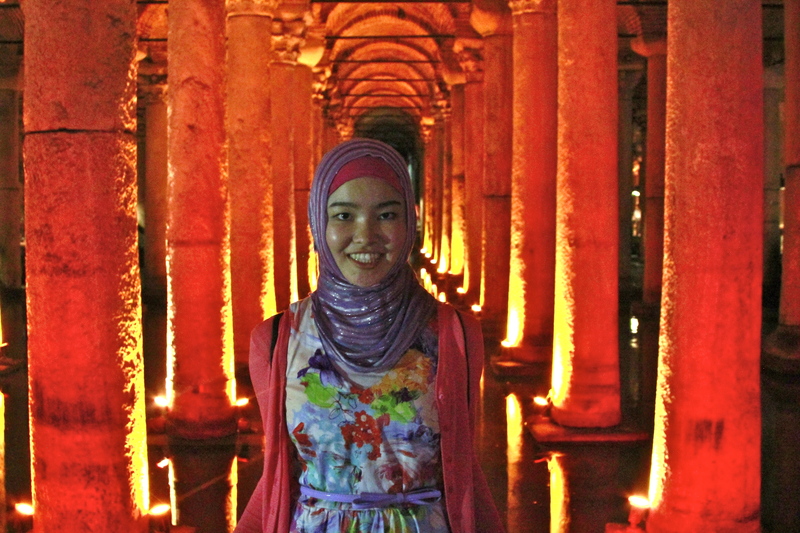 Ever since that Renaissance discovery, many travelers have longed to visit Basilica Cistern. 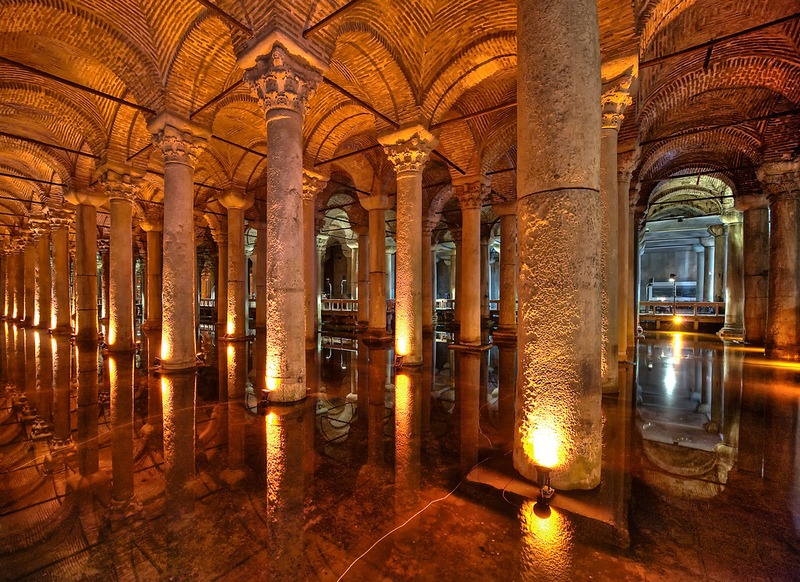 Here are a few facts and measurements to better visualize the grandeur of the Basilica Cistern, underground by around 52 steps from the surface. The length of the Cistern is 453 feet, its width 212 feet. It is a large rectangular underground structure supported 336 columns spread in 12 vaulted rows with the height of 30 feet. The view of columns from the entrance gives an impression that it is endless with its over 100,000 square feet of interior space. These columns resemble the columns in the Grand Mosque of Cordoba in Spain: a row of graceful columns similar to a row of palm trees. The ceiling gravity is distributed among the columns through the arched cross vaults. Some columns reflect Corinthian style capitals; others reflect Ionic or Doric style because they are spolia: reused here from somewhere else earlier. One column draws special attention due to engraved pictures resembling eyes and tears. As ancient texts suggest, these tears pay tribute to the hundreds of slaves who died during the construction of the Basilica Cistern. The cistern can store up to 100, 000 tons (almost 3 million cubic feet) of water underground and still holds a few feet of water with fish swimming around the columns. Since the Cistern is very dark, strolling in the Cistern in the daytime gives an impression that one is walking at night around a pond with fish. One of the most attractive features of this Cistern are two Medusa heads positioned as pedestals for columns located at the end of the Cistern. I was struck by the Medusa heads after passing the rows of columns. These two Medusa heads are masterpieces of Late Roman art. It is almost impossible not be curious about the origin of the Medusa heads here. According to one of the myths referenced here, Medusa was one of the three Gorgon sisters, female monsters in underground realm, who could turn people who looked at them into stone. According to another myth, Medusa was enamored with Perseus, Zeus’s son. Athena was also Perseus’s heroic protection from any harm. Envious Athena turned Medusa’s hair into snakes, and Medusa could turn people who looked at her into stone. 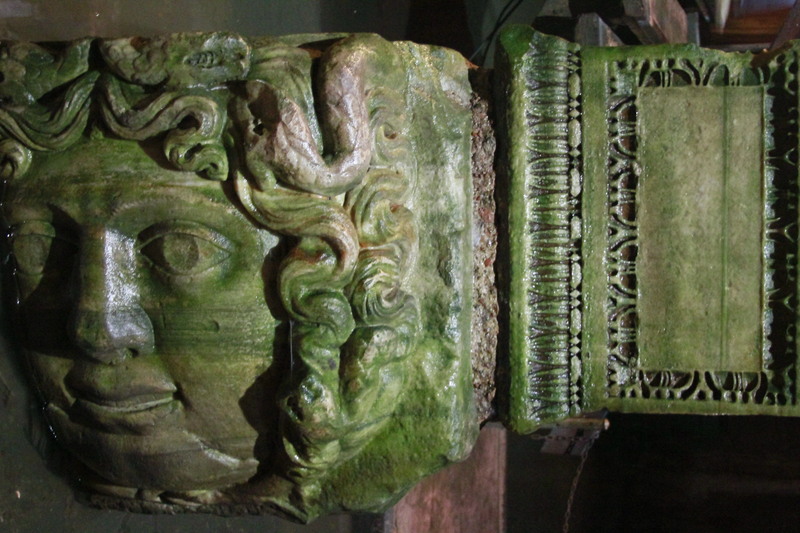 However, according to custom, Medusa heads were often placed on monuments, in this case watching over the Cistern as apotropaic guardians, since large Gorgon images were frequently used to protect important places in the Classical world. One of the Medusa heads is positioned upside down, and the other sideways. According to some interpretations, these heads were positioned as such in order to cancel out the power of the Gorgon’s petrifying gaze. Throughout the Cistern the columns are wet and smooth in touch and water drops harmoniously, producing a sound that reminds of Medusa’s melody to the visitors. I am by no means alone in finding the Cistern a marvelous place. The Basilica Cistern has attracted many visitors around the globe, including leaders like Bill Clinton, Ex-Prime Minister of the Netherlands Wim Kok, the 75th Prime Minister of Italy Lamberto Dini, Ex-Prime Minister of Sweden Goran Persson, and tenth President of Austria Thomas Klestil. The ancient Cistern has attracted film directors as well. The 1963 James Bond movie From Russia with Love, directed by Terence Young; the 2009 movie The International directed by Tom Tykwer, recorded some vignettes in this Cistern. Clive Cussler’s 2010 book Crescent Dawn (with Dirk Cussler), portions of it set in Istanbul, also has a chapter with a gun battle inside and an escape scene from the cistern. 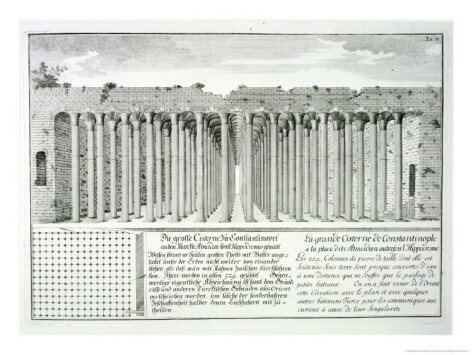 De Amicis’ description of the Cistern two centuries ago still matches the current state of the Cistern in the 21st century. The Cistern is a perfect escape from a hot summer day and a tranquil respite from the busy city above. Its ancient site is full of history and mystery; it can be both an unusual concert hall and a puzzling place with a venerable atmosphere that leaves many questions in visitors’ minds about antiquity and how some monuments survive when others do not. In this case, it’s likely because the basilica Cistern was underground rather than on the surface, and this dark location provides much of its haunting visuality. Very nice article, Aigerim. I envy you that you could have an extended time to visit such sites in Istanbul. Hope you could write more articles like this about other sites, as well. I was in west Turkey, 1957-1959, then only a million people in Istanbul. Never got into Topkapi which I missed. In the cistern we were given a ride in a rowboat. If you want to read and see views from those days, just find merhabaturkey – Youtube gets upset if links are listed so you have the main info to find that stuff.